Marcopolo buses hit the road of Bangalore with great fanfare in Novermber 2008. The city which first introduced Volvo City buses, made an attempt to introduce more AC buses. The local transport provider - Bangalore Metropolitan Transport Corporation - decided to try out Marcopolo buses in an attempt to introduce more AC buses, but at a lower expenditure. Tata Marcopolo seemed made for the role. 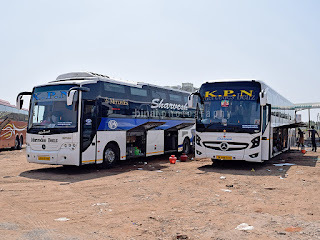 Two buses were provided for trials by Tata Marcopolo Motors Limited. These red-coloured monsters were powered by 230hp rear mount diesel engines, and were claimed to be better than a Volvo, while being more cost efficient and comfortable that a Volvo. These buses were introduced on two routes - KBS-Nelamangala and KBS-Hoskote. The effective frequency of these services was about once in three hours, which was later brought down to approximately one in 30 minutes using Volvo buses. The initial hype was shortlived since the buses could not be run on roads due to certain registration formalities, and the bus was actually put to service about a month after being flagged off by the transport minister, amid huge fanfare. The bus was not even a shadow of what the Volvo provides, and turned out to be an ill-planned box powered by a heavily vibrating engine that could be heard inside as good as a normal bus. 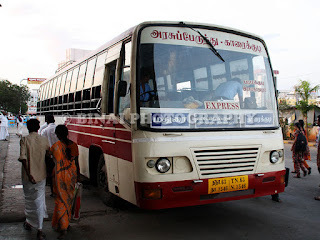 News reports suggest that this bus comes at a cost of Rs. 69 Lakhs, compared to Rs. 75 Lakhs for a Volvo B7RLE. Although the bus is cheaper than a Volvo, the cost still is steep for the meagre facilities provided by the bus. Yours truly was lucky to have a short ride on this contraption, and was seriously disappointed by the comfort level offered by the bus. The ride was noisy and the ride quality was not even half of the bus that it was supposed to compete with. A recent report (BMTC drops Marcopolo idea, for now - The New Indian Express, dated March 20, 2009) suggests that BMTC is dropping the idea for now. I would say this is a good decision. A cheaper alternative to Volvo is surely a welcome idea, but the alternative shouldn't be cheap when it comes to ride quality. The bus should atleast be able to isolate passengers from the noise of the engine, while providing a ride better than ordinary on the road. Some unconfirmed reports suggest that Mumbai's BEST has also ruled against the Marcopolo. TATA should be happy that it atleast won the order from DTC before these disgusting information came out. 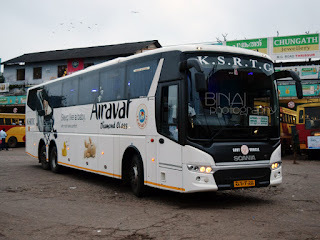 The corporation (BMTC) should perhaps turn its eye towards similar products from Ashok Leyland and may be King Long, and see if they fit its bill well! Till then, its all Volvos for the city! is the ashok leyland ibus out or not?